International Journal of Research in Health Sciences,2017,5,4,6-12. 1Department of Microbiology and 2Department of Medicine, Dayanand Medical College and Hospital, Ludhiana, 141001, Punjab, INDIA. Procalcitonin (PCT) is currently the most studied infection biomarker and its blood levels seem to mirror the severity of illness and outcome. PCT may help in discriminating bacterial from viral infections and true bacteremia from contaminated blood cultures. 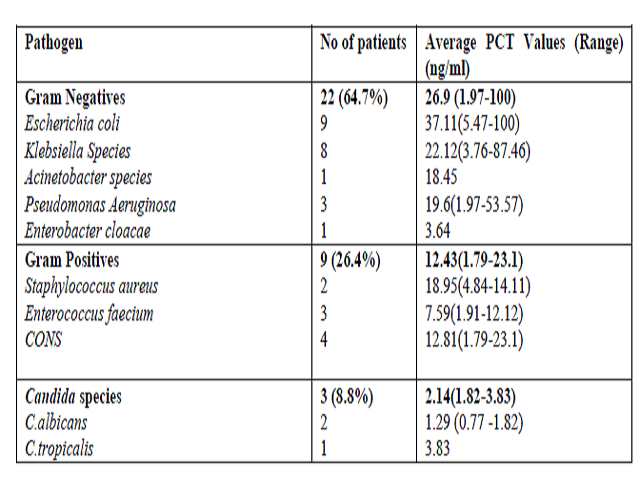 Correlations of PCT values with blood culture results were analyzed. Infective foci and clinical diagnosis were also compared in moderate SIRS, severe sepsis and septic shock. Out of total 100 cases, 87 had PCT value >=0.5 ng/ml whereas 13 had PCT value of <0.5 ng/ml. Infective foci were seen in 85% (74/87) of patients with PCT levels of >=0.5ng/ml. Blood culture positivity in moderate SIRS, severe sepsis and septic shock were 31.8%, 30.7% and 57.6 % respectively. PCT as a biological marker appears to have a significant value in identifying or ruling out an infection. It may be of value to distinguish Gram negative from Gram positive and fungal infections.